Greetings from YFL!!! Happy Veterans’ Day!!! We express extreme gratitude for all those who have served, and are serving to maintain and protect our freedom, along with their families. We are open today (11/12), and invite you to come to the mat to RESTORE this week. We will stretch deeply with the use of props, and let our minds “BE STILL”. Our Sanskrit focus is DHANYA, which is one of the eight limbs of yoga practice, and translates as “to meditate or contemplate”. Our supporting hand gesture (mudra) is the GANESHA, which aids in overcoming obstacles along our path of life. Our meditation focus is “BE STILL”, and may be contemplated while enjoying the music of Kiran Murti’s “Divine Imagination”. 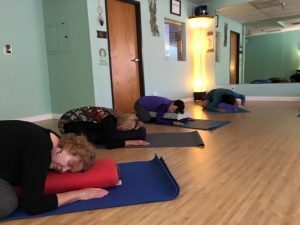 This week’s Yin practice will focus on the balancing of the seven chakras, and Deb will utilize the Tibetan bowls to help achieve this state of balance. The monthly Sangha (community) meditation class is this Thursday (11/15) from 7:30-8:00 p.m. Our Dharana, or focal point will be Candle Gazing, or Trataka. This class is FREE, and open to ALL!!! YFL will be closed in observance of the Thanksgiving Holiday on 11/22-11/25. This entry was posted in Uncategorized on November 12, 2018 by Deb Potts.